iTunes is a media player computer program, used for playing, downloading and organizing digital music and video files on desktop computers. It can also manage the contents on Apple's popular iPod, iPhone, iPod Touch and iPad. However, iTunes supports limited video format. See, import AVI to iTunes for playback, fail! Play YouTube video in iTunes, pipe dream! Watch DVD movie in iTunes, you must be kidding me. You will never make these happen without converting them to iTunes compatible format first. That being said, how to convert video or movie to iTunes friendly format? Which iTunes video converter should I rely on? I must confess I had the same confusion before. The must-share tool I have tried is the full-featured MacX Video Converter Free Edition, which provides a perfect solution to convert any video to iTunes for free on Mac (macOS Sierra included). It can free convert AVI, YouTube, MKV, VOB and other video files to iTunes acceptable video format with greatest possible of ease. All-in-one free iTunes converter to free encode AVI, FLV, MKV, YouTube to iTunes on Mac OS X Yosemite and El Capitan with No.1 fast speed (music video in 30 seconds). By using its efficient inner core, this iTunes converting software can complete video/movie to iTunes encoding task within a short time, with the original video quality preserved. And it also performs as quite a monster to convert any video to iPhone 6s/6s Plus, iPad Pro, iPad mini 4/Air 2, Galaxy S6 edge+/Note 5, HTC, Sony device with 350+ profiles provided. With the intuitive interface, you can convert AVI, YouTube, MKV or VOB video to iTunes without breaking much sweat, no matter you are a newbie or an expert. 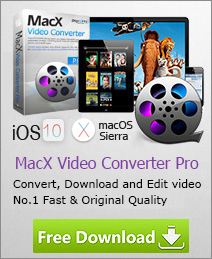 Just a click away, you can call the video to iTunes conversion task an end. Free download this tool on Mac and fire it up, then drag and drop video files to the iTunes video converter. Or click "Add File" to locate the files you want to convert. 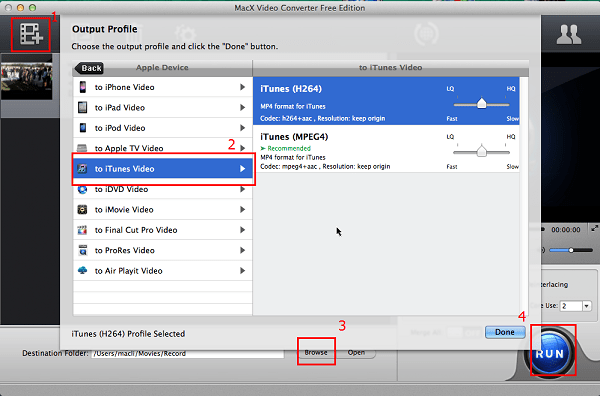 After the video files are imported, choose "to iTunes Video" as output video format. The video/audio settings will be adjusted automatically according to the chosen device preset. You can also set your own parameters. After all the settings, click "RUN" and begin to convert video to iTunes on Mac. When the conversion finished, you can play your video in iTunes, or enjoy them on your Apple devices, such as iPod, iPhone or iPad. 2. On the DVDvideo forum, tons of friends ask the same question about how to import DVD movie to iTunes so as to easily transfer DVD movies to iPhone iPad. Here I tell you the solution I prefer. That is converting DVD movie to iTunes MP4, MOV format under the assistance of the high-end iTunes DVD converter- MacX DVD Ripper Pro, which can effortlessly convert any DVD disc to iTunes, regardless of CSS, Region Code, RCE, UOPs, Sony ARccOS or Disney Fake, so as to let you transfer DVD movie to iPhone iPad for playback on the move. Get the best GoPro video converter to convert GoPro 4K/HD videos to MP4, MOV, WMV, FLV, or any other format you desire. Solve the problems when you cannot edit GoPro video in iMovie and choppy GoPro video playback error in VLC.